Balham SW12 Office & Home Window Cleaners | Quality Property Care Ltd. Along with your professional windows cleaning, you can also reserve one or more other maintenance services and outdoor cleaning. By booking more than one service provided by the business you will save a lot of time and money , and will get a full cleaning service at once. You can get professional gutter cleaning, patio or driveway jet washing, inside and outside conservatory window cleaning, gardening and others. Certainly, for a full cleaning, you can order indoor windows cleaning and curtain cleaning too. Indoor cleaning is done by hand with squeegees, safe and efficient windows cleaning treatment.So, you can get a perfect window and gutter cleaning, or only windows cleaning by booking the reliable and high-quality cleaning services of the company. There is no better way to wash windows in London than to call Quality Property Care Ltd. in Balham SW12, we come fully ready, capable of achieving up to 4 stories in height. There are some service requirements that need to be fulfilled in order for us to properly clean. The window must be in a fine condition, maintenance must have been passed before we can clean. A parking spot near the location of the cleaning, no further than 30 yards ultimately and a clean reach of the window without any obstructions, like branches or walls. Using specific inside window cleaning equipment and kits we are in a position to get every last dirt spec from the inside of your windows, from the sills, to the window, the frame, the insulation, knobs and even the blinds. We will not perform maintenance on said windows, simply cleaning until spotless. All liquids used by Quality Property Care Ltd. experts are appropriate for the proper cleaning of your windows, with high dirt build up prevention effects, and no window or sill damage. To effectively clean inside, we use a bucket, a sponge, a squeegee, some purified water and a lot of practical experience. 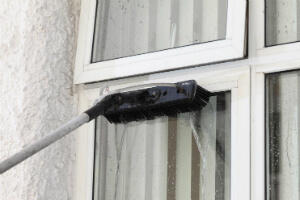 To arrange the windows cleaning service, just call up 020 3746 4287 or send an online booking request right now. The client care service is available, so you will receive a written confirmation as soon as possible. 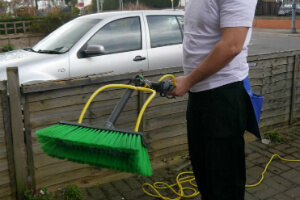 Same day cleaning service is available, and so is cleaning on weekends or bank holidays, with no added price. No down payment is demanded for booking, and big deals are offered for booking combined cleaning and maintenance services.